Apple trees (Malus spp.) are members of the rose family, making them close relatives of other fruiting plants like apricots and cherries. Apple plants are also highly ornamental with their showy springtime flowers followed by red, yellow or multi-colored fruits and golden to orange fall foliage. Hundreds of varieties have been bred from wild apple species over the centuries, giving rise to the modern large eating apples and ornamental crab apples extant. 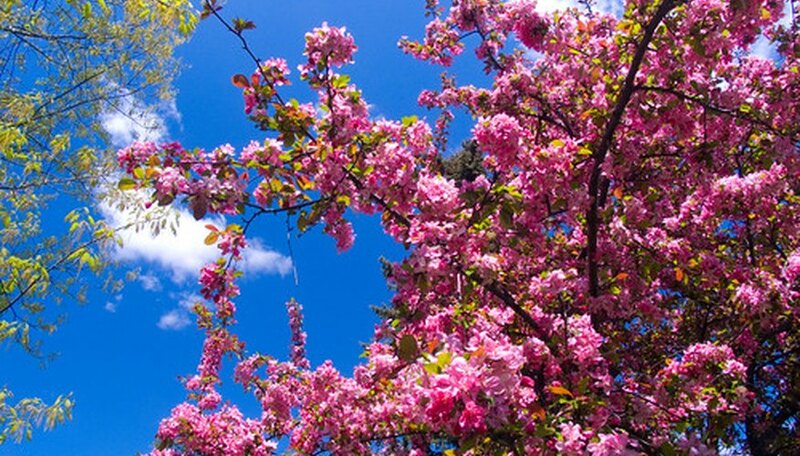 Apple trees are flowering plants, broadly called angiosperms. These plants have xylem and phloem vascular tissues in their stems, use double fertilization, and have closed carpels. These characteristics separate them from gymnosperms. Apples belong to the large plant family Rosaceae, or rose family, usually characterized with flowers having five petals and lots of stamens. Within the family are subfamilies, including Maloideae, which accounts for apples. Members of the Maloideae subfamily have a commonality: a compound ovary and the location of the ovary is below the petal attachment in the flower. All apples are grouped into a genus, or collection of species, named Malus. Within the genus are about 35 natural species and hundreds of man-made hybrids and cultivated varieties, called cultivars. 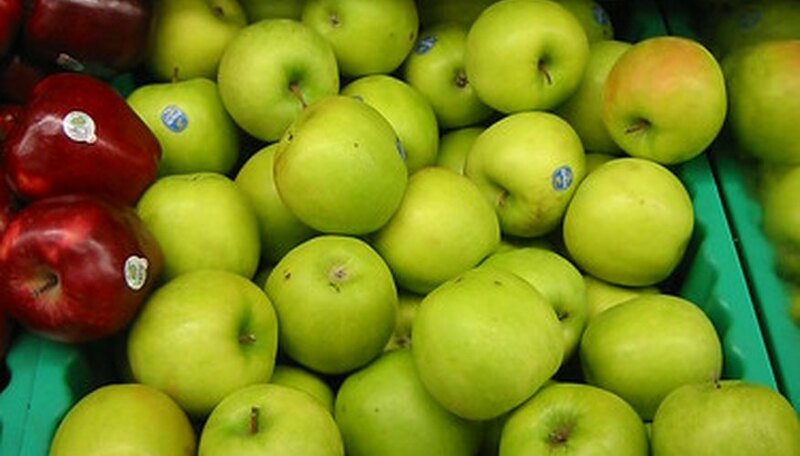 'Red Delicious' and 'Granny Smith' are two examples of apple cultivars. Large-sized apples that have been selected for their flesh flavors and tastiness are commonly called apples or edible apples, and can be further described in the vernacular as being a "sour," "green," "table," "baking," "cooking" or "eating" apple, among other descriptors. Crab apples are botanically no different than other apples, but in general if the fruit of the tree is less than 1/2 inch in diameter, it is commonly named and described as being a crab apple. 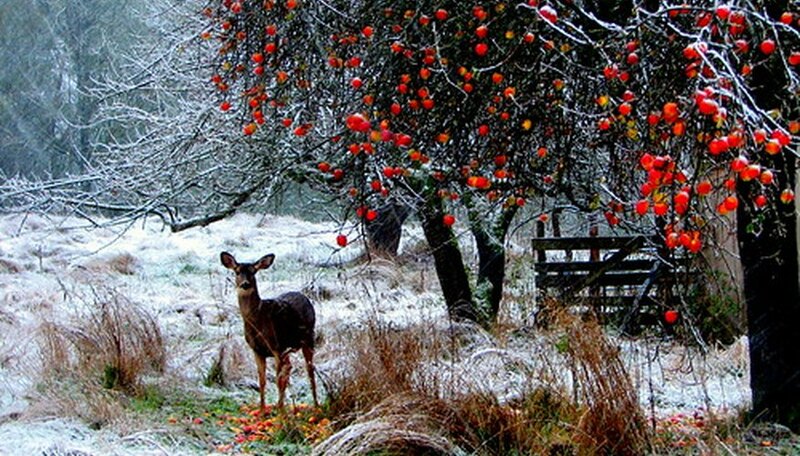 Apple trees, depending on species, are native to the Northern Hemisphere: Asia, Europe or North America. Although regarded as a delicious flowering and fruit tree, wild apple species often have apple fruits that are edible but unpalatable because of bitter acids and flavors. The modern apple (Malus x domestica) first appreciated in west-central Asia, is the result of human breeding or selection for larger, tasty fruits. Crab apple trees often produce edible small fruits, but are primarily regarded as ornamental plants having great spring flowering displays and crops of tiny apples that attract hungry songbirds for food. Apples are deciduous plants, ranging from trees to more shrub-like in appearance. Their leaves are ovals and naturally green, although reddish or purple-tinted foliage is common in spring when young. Leaf edges have tiny teeth. The flowers are cup-shaped with five petals and range in color from white to tones or pink to red-violet. Fruits are fleshy and are five-chambered in their cores. Apple fruit sizes range from nearly 5 or 6 inches in diameter to pea-sized, less than 1/2 inch in diameter. 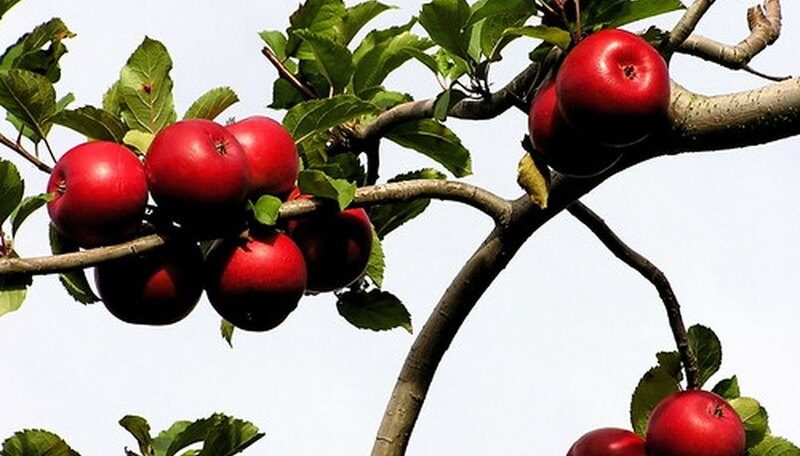 There are 35 naturally occurring wild species of Malus in the world. The domesticated apple (Malus x domestica) carries hundreds of cultivars and are popular in cold-winter regions for both their pretty springtime floweing displays and their crops of large, tasty fruits from summer to late autumn. Numerous hybrids of various apple species have lead to other intraspecific species, such as the Zumi crab (Malus x zumi) and Malus x purpurea. 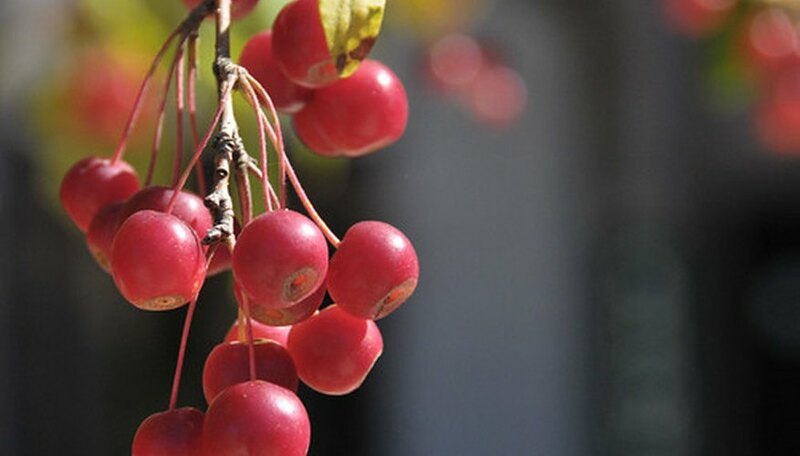 Siberian crab apple (Malus baccata) is an especially cold-tolerant species from northeastern Asia and is used to improve cold hardiness of other apples. Japanese flowering crab apple (Malus floribunda) is revered for prolific springtime flowering. Tea crab apple (Malus hupehensis) and Chinese crab apple (Malus prunifolia) produce fragrant white flowers and cherry-like fruits. Sargent's crab (Malus sargentii) is native to Japan, while Malus sylvestris hails from Europe. North American apple species include the southern crab apple (Malus angustifolia) and the prairie crab apple (Malus ioensis).